Who: Captain Lawrence and friends. 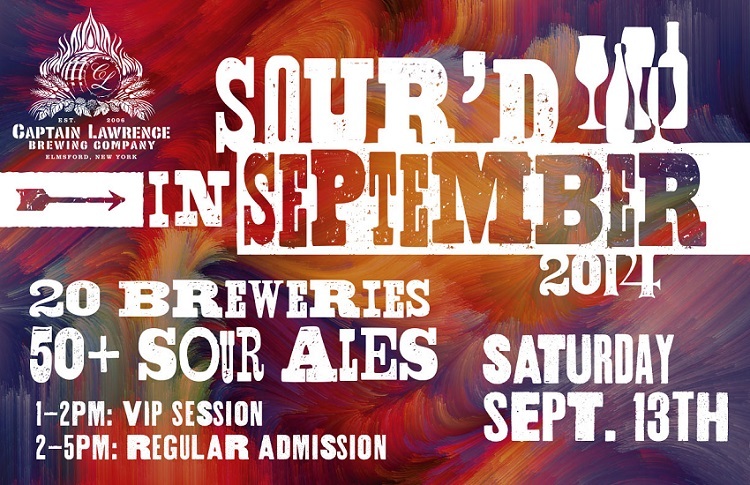 What: Sour’d in September, featuring 20 breweries from around the country and over 50 sour ales. This is the East Coast’s first annual Sour Beer Festival. Where: Captain Lawrence Brewing Company, 444 Saw Mill River Road, Elmsford, NY, 10523. When: Saturday, September 13th, 2014. VIP Session from 1 to 2 p.m., Regular Admission from 2 to 5 p.m.
Why: Because sour beer is awesome. Get your tickets & more information here. VIP tickets are already sold out, so get your general admission tickets ASAP! Tickets are on sale through September 1st.